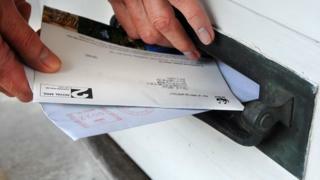 Low-level letterboxes should be banned to prevent postal workers straining their backs or being bitten by dogs, a Conservative MP has said. She called for all new letterboxes to be installed between 70cm (2ft 3.5ins) and 170cm (5ft 7ins). A similar campaign by its sister union in Ireland saw low-level letterboxes banned in 2001 and the CWU believes "the time has come" to replicate this in the UK. "There are over 95,000 postmen and women working for Royal Mail," she said. "They deliver to 30 million address, they serve each of our communities six days a week, every week of the year, and when I asked postal workers what I could do for them, they asked me to look at low-level letterboxes. "This bill simply wants to stop developers from building swathes of homes each with a letterbox placed near to the ground and I hope that this will be a moment of unity in British politics."